World Gold Council is a market development organization for the gold industry. Headquartered in UK, they have presence in Europe, Asia and the US. It is an association of 21 leading gold mining companies from all over the world. They work with the investment sector, jewellery industry and technological companies to provide industry leadership in this sector, and to ensure that the demand and supply of Gold all over the world is balanced. 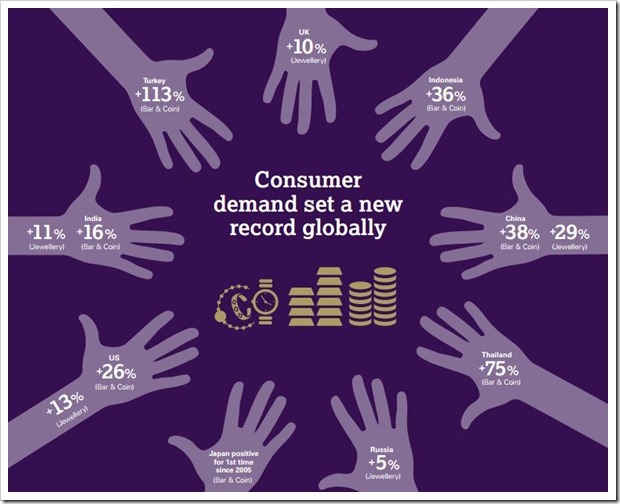 They have recently released a Gold Demand Trends Report for the year 2013, which shares statistics and opinions related with world-wide Gold demand. – Demand for Gold jewellery rose 17% to 2209 tonnes, which is the strongest increase in the last 16 years. – Investment in Gold bars and coins increased 28% to 1654 tonnes as investors took advantage of lower price and open market. From Western investment markets, a record 880 tonnes of Gold outflow was recorded. – In 2013, consumer demand in India increased to 975 tonnes of Gold, which is an increase of 13% compared to 2012. Consumer demand in China rose 32% for the same period. – Technology sector used 405 tonnes of Gold in 2013. Improved economy all over the world, and technological innovation resulted in such excellent demand. – The supply of Gold lowered to 4339 tonnes, which is a decrease of 2% compared to 2012. This less supply of Gold is a result of drop in recycling activity as gold prices were low. – Indian Government imposed a ban on Gold import last year, which somewhat affected the market sentiments inside India, but it failed to make large scale effect. – Gold prices fell sharply in the second quarter of 2013, which invoked swift response from the Middle East and Asian markets. This ripple effect spread to the Western markets by 4th quarter, thereby increasing demand globally. – The average Gold prices in various currencies such as US Dollar, Pound, Yuan, Euro etc was 16% lower than 2012. But due to currency exchange rates, Gold prices in countries such as India, Japan, Turkey experienced volatile fluctuations in the Gold prices all through the year. – World Gold Council surveyed 2000+ Indian and Chinese consumers, and found that 36% of Indians will buy more Gold in 2014; 39% will buy the same amount and 19% will buy less. Whereas 44% Chinese told that they will buy more gold; 35% told they they will buy the same amount and 15% told they their Gold spending would be less. You can get the World Gold Council Report for the year 2013 here.